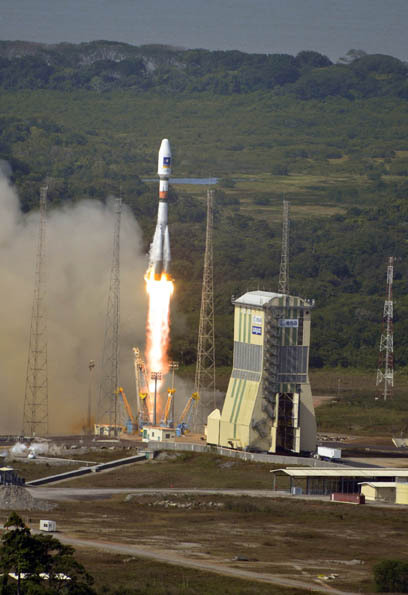 Europe’s GNSS program placed two more satellites into orbit today (December 17, 2015), doubling the number of Galileo spacecraft in space in the course of nine months from 6 to 12. Galileo 11 and 12 — the full Operational Capability (FOC) satellites numbers 7 and 8 — lifted off together at 6:51 a.m. EST (12:51 CET, 11:51 UTC, 8:51 a.m. local time) atop a Soyuz rocket from Europe’s spaceport near Kourou, French Guiana. European Space Agency (ESA) officials described the launch as “a textbook operation” with all Soyuz stages performing as planned. A Fregat upper stage deployed the twin satellites into orbit nearly 23,500 kilometers (14,570 miles) in altitude, about three hours and 48 minutes after liftoff. "With today’s launch, Europe has doubled the number of its Galileo satellites in orbit in just nine months," commented Jan Woerner, director general of ESA. "Along with the ground stations put in place around the globe, this brings Galileo’s completion within reach. Initial Galileo services are scheduled to begin within [the] next year." A pair of Galileo satellites launched in March entered service earlier this month. "The excellent performance of these satellites, as measured on the ground, allows Europe to join the club of the world wide providers of satellite navigation services," added Didier Faivre, ESA’s director of Galileo and Navigation-related Activities. Production, testing and launch of the remaining satellites are now proceeding on “a steady basis according to plan,” Faivre said. After many years of delay caused by technical, budgetary, and political difficulties, the Galileo program appears to have gained solid footing for a more rapid implementation of the GNSS system by the end of this decade. The pace of deployment will increase in the second half of 2016 with the first of three launches that will carry four rather than two satellites into orbit on board customized Ariane 5 rockets. This month marks the 10th anniversary of the launch of Europe’s very first navigation satellite: GIOVE-A, on 28 December 2005. It secured the frequencies set aside for Galileo, gathered data on the medium-altitude orbit environment and flight-tested hardware for the working system.